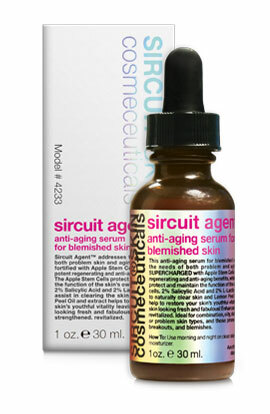 Sircuit Agent™+ anti-aging serum for blemished skin uniquely addresses the needs of both problem and aging skin. SUPERCHARGED with Apple Stem Cells for their antioxidant benefits along with anti-aging properties that can help to improve the overall skin appearance. 2% Salicylic Acid and 2% L-Lactic Acid helps to naturally improve skin tone. Lemon Peel Extract helps restore youthful vitality leaving your skin looking fresh and fabulous! Another good deed done for the day! Improves the appearance of skin texture and tone. Gradually helps to fade skin discoloration. Helps restore natural radiance and vitality. Minimizes the effects of free radical damage. Skin Type: Ideal for combination, oily, dull, lackluster and/or problem skin types, and those prone to congestion, breakouts and blemishes. How To: Use morning and night on clean skin before applying moisturizer. Dispense a small amount to the back of your hand and apply to the face with light tapping motions avoiding eye area. Sircuit Agent™+ is a daily treatment serum that will help assist clearing the skin and is the perfect complement to your home treatment program. Shake well before use. Alpha Bisabolol (L): Commonly used to help soothe the skin. 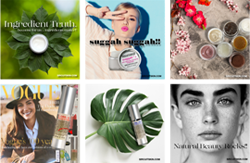 Mushroom Extract (Fomus Officinalis): A skin protecting extract that also provides astringent characteristics that can help to tighten and minimize the look of pores which allows for a natural, healthy glow. Lemon Peel Essential Oil (Organic): Stimulating and refreshing with potential brightening properties. Grapefruit Essential Oil (Organic): Stimulating and refreshing with potential astringent benefits. Limonene (L): A Chirally Correct form of a bioflavonoid found in citrus rinds that is a powerful antioxidant which helps to restore skin tone and enhances the natural cleansing and detoxification processes of the skin. Formulated With: Hamamelis Virginiana (Witch Hazel) Water, Alcohol Denat., Glycerin, Aqua (Water), Lactic Acid (L), Salicylic Acid, Menthyl Lactate (L), Bisabolol (L-alpha), Fomes Officinalis (Mushroom) Extract, Silver Phosphate*, Niacinamide, Melaleuca Alternifolia (Tea Tree) Leaf Oil*, Citrus Medica Limonum (Lemon) Peel Oil*, Malus Domestica (Apple) Fruit Cell Culture Extract, Citrus Paradisi (White Grapefruit) Peel Oil*, Citrus Medica Limonum (Lemon) Peel Extract, Xanthan Gum, Limonene (L), Phenoxyethanol, Lecithin. *USDA Certified Organic | NOP. Phthalate-free. Special Note: Clients allergic to aspirin (which is Salicylate based) or during pregnancy might want to avoid this serum.